I like pizza. Ok, I don’t just like pizza, I love pizza. Despite having a great career and a job I love, my favourite job ever was the 2 years I spent slapping dat dough at Domino’s Pizza in Ansdell, Lytham St Annes. Not only that, my name on Plenty Of Fish (oh yes, I’m on there) is Pizza4Lyf. That’s how much I love pizza… it’s also a little insight into why I’m single. But back to pizza… GOAT (an Italian restaurant and cocktail bar) on Fulham Rd in Chelsea launched a new menu and I was invited along to try it. Now it’s not often I say this up front but… IT WAS WONDERFUL. The evening was just bloomin’ lovely and I’ll tell you for why. Truth be told… I’m not a Chelsea sort of gal. I’m more of a Earle Haigh in Crouch End on a Saturday night kind of girl. But hey, I like to try new things, and new things I did try. I ventured West of the border into MIC territory and not only did I survive… but I bloody well enjoyed it. I took a friend with me to try their new menu and that, for us, meant kicking off with a cocktail. Our waiter was Zeb and he recommended the Astoria, describing it as “boozy” and boozy it certainly was – as I genuinely can’t remember the names of the three cocktails that followed it. What I do know is they were delicious. One thing that I noticed straight away was the atmosphere in the restaurant… it was so relaxed and the staff so friendly that we instantly felt at ease, so much so that we stayed for almost 3 hours*. *FYI I’m not above being thrown out of a restaurant for outstaying my welcome. So to the food… I cannot complain… and believe me, if I could, I would. It was excellent. We shared some nocellara olives and a starter of burrata, datterini tomatoes and homemade genovese pesto to start. And yes, it was every bit as good as it sounds. 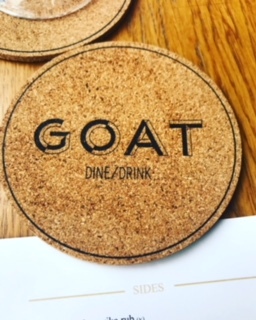 Everything about this place was great and I can’t recommend GOAT enough. I’d go back again in a heartbeat. We then followed with pizzas. I had the goat's cheese, mozzarella, zucchini, pink radish and rocket and my friend had the bresaola, parmesan, pesto, rocket, truffle oil, white base. As you may have gathered from my earlier revelation of my Domino’s days… I am a bit of a pizza connoisseur, but both these pizzas were the absolute fire emoji times 3. I can not and will not fault them. Admittedly on leaving the restaurant, we jumped straight back on the tube to the comfort of life in North London but yeah, can’t win them all.